Winner of the 2014 Monin Cup! News Winner of the 2014 UAE Monin Cup! The BlackJack Cocktail, featuring Classic Hapsburg Absinthe! 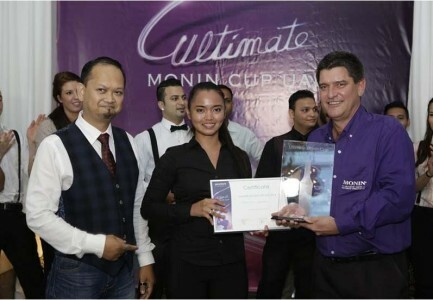 Kathlene Magday from Mint Leaf of London won the UAE heats of the Monin Cup, and will go on to represent the Emirates in the Ultimate Monin Cup International Final 2014 in France. She fought off 15 other finalists, whittled down from more than 70 registrations, from across venues in the country, including Burj Al Arab, Fairmont hotels, Waldorf Astoria, Grosvenor House Dubai, and more. Her winning cocktail was called ‘The Black Jack’ and was created using Monin’s green apple syrup along with Jack Daniel’s honey, Hapsburg absinthe, lemon juice and ginger. The mocktail was named ‘Mayday Monin Mystery’ using Monin passionfruit syrup, apple juice, tarragon leaves, lemongrass sticks, and grapefruit wedges. The first runner up was Stephan Mases from Burj Al Arab, while the second runner up position went to Ankush Kondal from JW Marriott Marquis, Dubai. The event, which was held at the JW Marriott Marquis Dubai, had a panel of six judges: Monin’s Andrea Fidora (head judge); Zuma bar manager Jimmy Barrat (sensory judge); Fresh Express brand manager Lasanthi de Silva (sensory judge); Atelier M bar manager Tomas Dundulis (sensory judge); MMI beverage training manager Nick Ord (sensory judge); Jose Cuervo brand ambassador Hirman Asnadi (technical judge); Patiala bar manager Archie Avinante (technical judge). The Monin Cup is a competition that brings together professional bartenders competing through creating the best recipes using Monin products, based on cocktail and mocktail recipe each. The bartenders allowed to enter have to be under 27 years of age, as the French firm is keen to highlight the next generation of talented and passionate bartenders.